DRM, the abbreviation of Digital Right Management, always restricts users to enjoy their purchased or subscribed multimedia contents including videos, songs and books on their own devices. If you also feel frustrated of being stuck and restricted, probably you need DRM removal software. In this article, we list top 4 DRM removal freeware which were widely used before. However, as the time goes by, the free DRM removal software may become outdated and unusable. So We also provide best alternatives to help you get DRM-free copies. Does DRM Mean Digital Restriction Management? DRM is a widely discussed topic among iTunes users who buy or rent iTunes movies or subscribe Apple Music. Sometimes, DRM really makes users feel frustrated because DRM prevent the users to enjoy their purchased, rental or subscribed contents on any devices they own. Actually, DRM technology is widely used, not only by Apple on iTunes multimedia, but also by Amazon, Microsoft, Sony and many comapanies on videos, songs, books, games, software programs and other aspects. DRM restricts the users to play the contents on specific devices only. That’s why many people think DRM as the abbreviation of Digital Restrictions Management, though it is actually short for Digital Right Management. Because of the inconvenience, many users look for either free or paid DRM removal software to solve their problems. In this article, we will introduce top 4 DRM removal freeware for you. You can check whether they can work on your computer and meet your requirements. Meanwhile, we also provide paid programs as alternatives as the free DRM removal software may be outdated and unusable. The top 4 free DRM removal software for videos, music and books are Requiem, MyFairTunes, Calibre and Fairuse4WM. Requiem is regarded as the most powerful DRM removal freeware. It can losslessly remove Apple’s FairPlay DRM from purchased iTunes M4V videos, M4P songs and ibooks. Requiem will automatically detect any DRM protected files including videos, music and books in iTunes library, simply decrypt the files and remove DRM without re-encoding unlike some so-called DRM removal software using screen recording or audio recording. Requiem will also move the converted DRM files to trash. You can directly click the link we provide here to download Requiem for Windows, Requiem for Mac and its source code from Digiex Forum. However, Requiem lost the game during the long run with Apple. When iTunes upgraded to version 11, Requiem could no longer remove DRM because of Apple's technology update. The latest version of this free DRM removal software remained at 4.1. Requiem was permanently stopped development. If you still want to use Requiem, you need to downgrade iTunes to 10.7 or lower, which is not feasible. iTunes 10.7 or lower can neither support new iOS system like iOS 11, nor support new models like iPhone 7, iPhone 8, iPhone X, etc. As to Apple Music, iTunes 12.2 or later should be installed. Obviously, though Requiem is DRM removal free, it's outdated and unusable for most users. The best Requiem alternative is a software bundle called TuneMobie iTunes Converter Toolkit. TuneMobie iTunes Converer Toolkit includes M4V Converter Plus and Apple Music Converter. M4V Converter Plus can help you convert purchased or rental iTunes M4V videos to MP4 with multilingual subtitles, audio tracks, audio descriptions, closed captions and Dolby 5.1 track retained, while Apple Music Converter can convert Apple Music tracks, M4P songs, M4B/AA/AAX audiobooks, etc. with ID3 tags and metadata preserved. Both Apple Music Converter and M4V Converter Plus can help you get best output files without quality loss. Apple Music Converter can work on Windows 7/8/8.1/10 and Mac 10.9.5 or above including macOS Mojave, while M4V Converter Plus can work on Windows 7/8/8.1/10 and Mac 10.9.5 - 10.12.6. Latest verion of iTunes will be always supported. However, MyFairTunes can only work with iTunes 6 or 7 and Microsoft .NET Framework 2.0 must be installed. It can’t convert downloaded Apple Music tracks which are also in M4P format. Besides, you can only use it on Windows and there is no Mac version. Actually, the program has been abandoned. Only MP3 output format in free version, there was a paid version but it won't work neither. As free M4P music converter, MyFairTunes is outdated and ususable. If you need to convert iTunes music or get DRM-free copies of Apple Music songs, then you should try TuneMobie Apple Music Converter. TuneMobie Apple Music Converter is the best alternative to MyFairTunes, it can lossless convert Apple Music songs, M4B audiobooks, AA/AAX audiobooks, M4P songs and any other iTunes supported audio files to MP3, M4A, WAV, FLAC, etc. with ID3 tags and metadata preserved. It’s fully compatible with latest iTunes and there are both Windows and Mac versions. 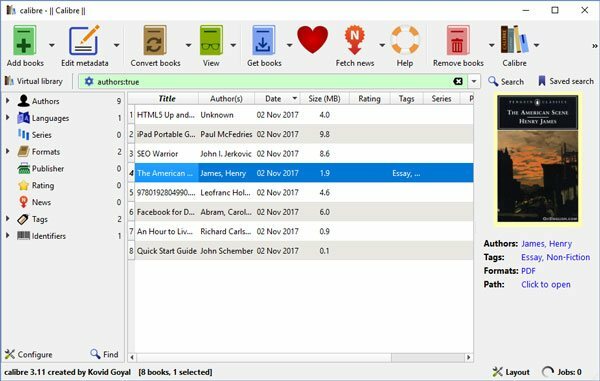 Calibre is a combination of free eBook manager and free eBook converter. Calibre allows you to add more than 50 formats of ebooks to iTunes, edit metadata in bulk or individually, convert eBooks to for different eBook reading devices including Cybook, General e-ink, iPad, Hanlin V3/V5, Kindle DX, Kindle Fire, Kindle PaperWhite, Nook, Nook HD+, Nook Color, Samsung Galaxy, Sony Reader and various tablets. The most advantage of Calibre is the program is still under development. On September 3, 2018, Calibre V3.31 was released with new features and bug fixes. By default, Calibre can’t convert DRM protected eBooks, however, you can install DeDRM plug for that. After installing DeDRM plugin, you can add DRM protected eBooks to Calibre and Calibre will automatically remove DRM and give you an unprotected edition. With DeDRM plugin installed, Calibre can be used as free DRM removal software for ebooks. On June 2, 2018, DeDRM V6.6.1 was released and the release note was "First release using the new directory structure and release script. Hopefully fixes the problem with KFX and the stand-alone tools". That's to say, as free ebook DRM removal software, Calibre has very limited support for Kindle KFX. If you want to convert Kindle KFX files to other eBook formats, we recommend you try Epubor Ultimate instead which seems to be the only software you can use to remove Kindle KFX DRM. Calibre itself is not designed for DRM removal, but with DeDRM plugin, you can use it as free ebook DRM removal software for some ebooks. However, if you want a more powerful ebook DRM remover, Epubor Ultimate would be a good choice. Epubor Ultimate can easily convert your purchased eBooks from Amazon Kindle, Nook, Sony, Kobo, Google Play, Lulu, Smashwords, Fictionwise and more line eBook stores, convert EPUB, PDF, AZW, AZW1, AZW3, AZW4, Mobi, PRC, TPZ, Topaz, TXT, HTML, etc. to EPUB, Mobi, AZW3, and PDF for all kinds of eBook readers. Epubor Ultimate simply removes eBook DRM protection in two steps, and can remove Kindle KFX DRM which Calibre can’t convert. Visit Epubor official website to learn more. 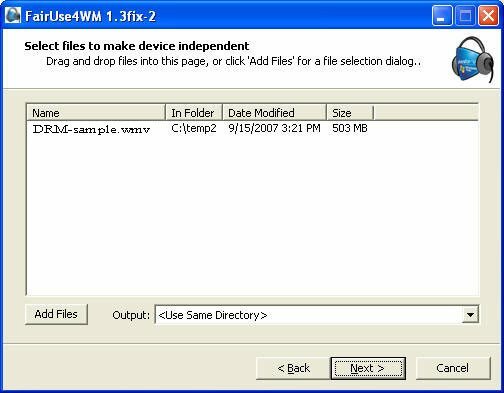 FairUse4WM is a DRM removal freeware for Windows media only. To be more specific, it works only on Windows Media DRM 10 and DRM 11 (aka, PlaysForSure). So you can use it to get rid of DRM protection on protected WMV, ASF or WMA files. FairUse4WM is also outdated and the latest version is 1.3 Fix 2 released on March 17, 2007. You can click to download FairUse4WM 1.3 or learn more information of this free DRM removal software on VideoHelp Forum. Aimersoft DRM Media Converter can legally bypass digital copyright protection from M4V, WMV and ASF video downloaded or purchased from iTunes, Windows Media Centre, Zune Marketplace, BBC iPlayer, Xbox Live Store, Amazon Instant Video, Limewire, uTorrent, FrostWire and more, as well as remove DRM protection from AA, AAX, M4B, M4P, etc. and audio files purchased from iTunes, Audible, Zune, Napster and more. Note: Aimersoft DRM Media Converter uses screen recording technology to convert iTunes M4V and WMV videos, so there won’t be audio tracks and subtitles in output files. And output video quality is not so good. Aimersoft DRM Media Converter can handle M4P songs sold by Apple before 2009, but can’t be used to convert downloaded Apple Music M4P tracks. We recommend you use TuneMobie M4V Converter Plus for converting purchased and rental iTunes M4V movies and use TuneMobie Apple Music Converter for converting Apple Music songs. Aimersoft DRM Media Converter is only recommended for converting DRM protected WMV and WMA files. Most free DRM removal software programs are outdated. There are many reasons. One is that DRM protection technology will be upgraded time and time, the developers have to spend time and energy to find out a way to deal with it. Another is that freeware doesn’t bring any income for the developers and they have to give up in the long run of life. The exception in the list above is Calibre, however, you can see Calibre accepts donation and there are also advertisement on its website. Only your support to DRM removal software developers can help you enjoy DRM protected videos, music and eBooks freely in deed. Still want professional DRM removal software for free? Then you should never miss the chance to get free license from TuneMobie. With TuneMobie products, you can easily get DRM-free copies from your iTunes videos, Apple Music songs and audiobooks.